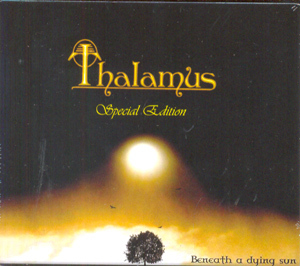 Soul is the newest universe bending, bone crushing CD from the Borlange based band THALAMUS. Their third full length piece to date. Like their previous cd Subterfuge (Transubstans 2011) it has a blend of low tempo songs and heavy stuff. But where Subterfuge tends to spin off into a bluesier mood, Soul is all about plain seventies hard rock in a modern suit.....with just a little flirt towards a progressive side. Bassist Peter Johansson explains:"For the first time we did all pre-production together. We had five months at my house, writing and pre-recording material. It was a new step for us; previously everyone brought their own songs, now we all took part in what everyone was doing. The result was that all songs almost directly became THALAMUS songs, with the same nerve as how we deliver the songs live." The CD got entitled Soul because of its heartfelt and honest expression. "Even though the lyrics touches anything from nonsense to depression, death to love", says vocalist/guitarist Kjell Bergendahl, "it could be sorted under the name Soul, which for me means honesty, sincerity and acknowledgement of your inner self. The lyrics are different, more heartfelt, as you will also notice, sung differently, more dynamic than our previous CD's." Except for Kjell and Peter, Thalamus is, Sebastian Olsson on drums and percussion, Joakhim Åslund on Hammond, keyboards and backing vocals and finally Mats Gesar on guitar. Soul is produced together with Daniel Bergstrand (Inflames; Meshuggah, Evergrey etc.) who also recorded drums, vocals and mixed the CD. As Subterfuge went to a top 6 place in the Swedish national charts 2011, the expectation for Soul is high. Both the band and people from the music industry that has listen to Soul, rates it to be THALAMUS best so far.